FSMIS (January 31, 2014): FSM President Manny Mori has appointed Mr. Asterio Takesy, FSM Ambassador to the United States, as his representative and representative of the FSM Government to the State of Israel. "Desiring to maintain and promote the relations of special friendship and good accord which happily exist between the Federated States of Micronesia and the State of Israel, I have appointed Mr. Asterio Takesy to represent me before your Government as Ambassador Extraordinary and Plenipotentiary of the Federated States of Micronesia to the State of Israel, with residence in Washington D.C."
Ambassador Takesy has been appointed to a post also previously held by his predecessor who is now a Member of the FSM Congress, Ambassador Yosiwo George. The letter to President Peres requests for the credence to all that Mr. Takesy will undertake in the name of the President and the Government of the FSM. FSMIS (January 31, 2014): On January 29, the nomination for Mr. W-One Williander to be the National Election Commissioner for the State of Chuuk was transmitted to the Congress of the Federated States of Micronesia. As shown on President Manny Mori's communication to Congress regarding the nomination, Mr. Williander had been a member of the Chuuk State Legislature from 1997 to 2013, representing the Tolensom Municipality. He also had served as a member of the Tolensom Municipal Council for four years and as the Principal of the Nechocho Elementary School on Tolensom from 1989 to 1997 prior to becoming a State Legislator. Information provided by the nominee shows that Mr. Williander has an A.S. in Education from the Eastern Arizona College in the U.S. According to Congress staff, Congress deferred action on the nomination to its next session to be able to seek for more information regarding the nominee. The post had been previously held by Mr. Necksin Bossy from the Island of Weno in the Northern Namoneas Region. On January 21, 2014, President Mori met with Congress at its temporary chambers in the Central Facility at Palikir. The purpose of the meeting was to discuss problems identified with the public project appropriation process as it relates to the implementation project and usage of the Project Control Document (PCD). No staff was present during this initial meeting. During the meeting, it was agreed that a follow-up meeting would be held, with staff from both Congress and the Executive, so that the problems could be fully discussed with input from the staff. A joint working group was created including Chairmen Urusemal, Simina, George, and Christian, as well as Vice President Alik and Secretaries Ikosia, A. Skilling, Itimai, and Director Adolph. While President Mori wanted the follow-up meeting held over the next few days in order to move ahead with implementation of recently approved laws, for various reasons, Congress was unable to meet until the proposed date of January 27, 2014. The January 27th meeting was scheduled to be held at 1:30 p.m. in the Presidential Conference Room to: (1) discuss and work out problems with the Project Control Document (PCD) and the appropriation process by Congress as they relate to the ability of the Executive Branch to implement public projects; and, (2) to stop ongoing violations of the Udot case, which case defines the Constitutional powers of Congress to appropriate public funds and the Executive to fully execute and implement all national laws. The meeting started at 2:05 p.m. after the location for the meeting was changed by Congress to the Congressional chambers in the Central Facility. Congressional members present included Speaker Halbert, Chairman George, and Chairman Simina. Missing were Chairman Urusemal and Chairman Christian. No Congressional staff attended. Executive members present included President Mori, Secretary Ikosia, Secretary Itimai, Secretary April Skilling, AAG Atanraoi-Reim, Esiri Edward, Molina Seneres, Sohs John, Marcellus Akapito, and Karnim Judah. Missing were Vice President Alik and Director Adolph. The President noted that no staff attended on behalf of Congress and expressed his disappointment that without staff, the discussion would only be one-sided and that there would be no one (on the Congressional side) to take notes with staff input into the discussion, and no one on Congress’ side to reduce the outcome of the meeting to a written agreement. The President emphasized that while the PCD is within the jurisdiction of the Executive, it cannot work well without the Congressional part improving, too. And, that he did not just want to “talk, talk, talk” but to come to an agreement with Congress about needed improvements. Speaker Halbert responded that talking is very important and that “talking is the Micronesian way.” President Mori agreed stating but added that “beyond talking, there must be action to follow up.” President Mori additionally pointed out that if there were continued violations of law, there would really be a problem. Chairman Simina asked what problems the President had with P.L. 18-35? President Mori outlined one of the problems in Chairman Christian’s portion of the bill noting that there was no breakdown and that it must be specific enough so that Congress does not get involved in it after the appropriation was completed. An example the President gave was in the line item “leadership travel.” How does that help us on the Executive side, President Mori asked. Once the money for the projects is appropriated, there should be no coaching by or deciding by Congress on how the money should be spent. But the appropriation example given does not say who is travelling, where, for what purpose, etc. Therefore, in the absence of public hearings or Committee Reports, the Executive must go back to Congress to get clarification. This slows down the process when pre-appropriation discussions, public hearings, and Committee Reports on the part of Congress could resolve the problem. Chairman Simina asked if it was just specificity that President Mori was seeking, and President Mori responded that there should be “at least guidelines.” Chairman George asked why not use the PCD to disapprove projects on the basis of no guidelines, purpose, etc.? President Mori stated that the Executive is trying to improve the PCD, but that the appropriation process for public funds, according to Chairman Christian, was “just the nature of the beast.” Chairman George followed up stating that (1) the Executive could first line item veto any public project that did not contain enough specificity, and (2) that when the PCD was submitted, if the Executive (as allottee) was not satisfied, it could stop there. President Mori stated that the Constitution is very clear. Congress cannot get involved after the law is passed, and added that there must be consultations with constituents ahead of time, public hearings, and Committee Reports. President Mori emphasized that “we want to stop the abuse.” Furthermore, President Mori stated that we must start linking projects to the issue of economic growth in order to prepare for 2023. President Mori admitted that when he was in Congress, he did the same thing as what is currently happening, unaware of the dictates of the Udot case. But now that he read and understands the Udot case and has raised his hand to uphold the law as President, he understands that things must change. President Mori went on to say that there must be attachments provided to the Executive regarding public projects such as documentation of meeting with constituents ahead of time. “Rather than clarify the PCD after the fact, there should be meetings with constituents, public hearings, and Committee Reports,” which documentation could then be in the bill itself or attached to the PCD for clarification and inclusion of technical requirements/aspects without having to return to Congress. Chairman Simina said that after legislation is passed and money appropriated, then the allottee must enforce it through the PCD. “I thought generic details allowed more flexibility to implement the project,” he stated. Chairman George also agreed that general terms allowed for more flexibility. President Mori responded that the Executive should be guided by public hearings and Committee Reports, and that the PCD should reflect it. “Without that part, it is just guesswork,” President Mori remarked. An example of one of the problems with the language being too general included an appropriation for repatriation of remains. President Mori pointed out that this appropriation provided no guidance but left the implementer to wonder whose remains? From where? From Guam, the US, Korea? Are we even allowed to repatriate remains from another country? President Mori asked why there was a double standard – one for the Operational Budget of the Executive where public hearings were held and one for Congress’ public projects where no public hearings are held. Speaker Halbert asked why they should be the same stating that whereas the operational budget is something Congress must pass, there is no such requirement for public projects because public projects are not required by law. President Mori explained that both appropriations expend public funds and that the public had a right to be informed ahead of the passage of the public project appropriations so that the public could be heard on what they want, noting that the public may view the project needs differently than Congress. President Mori asked again what Congress is willing to offer? Consultations before the bill passage; public hearings; Committee Reports? There was no response or counteroffer from the Congress members present to President Mori. Chairman George stated that they do speak with constituents in order to determine the public projects. President Mori suggested that if public hearings were held, then the results of these meetings with constituents could be presented, which would help with the implementation process and PCD after the law was passed. President Mori asked that both sides come to a voluntary agreement concerning the need to have pre-passage consultations with constituents, public hearings, and Committee Reports, and that the results would then be attached to the PCD for clarification, eliminating the need to return to Congress or have Congress violate the Udot case by having to become involved and decide how funds were to be spent or who would be the recipients. Chairman George and Chairman Simina both inquired about the implementation of the $4.9 million. President Mori responded that more guidance was needed (to implement the law). Chairman Simina asked if (in the future) it would be helpful if each state was in a separate appropriation, not lumped together. President Mori agreed it would help, especially since the state appropriations have little commonality as between states. Speaker Halbert asked if, the way President Mori was looking at the Udot case, amendments violated Udot? President Mori explained that no, amendments did not violate the Udot case if the implementation process on a particular project had not yet begun. Chairman George questioned how the Udot case applied to Congress as it did not involve the prosecution of Congressional members. President Mori explained that the Udot case was referenced in cases where allottees were prosecuted and that the Udot case referred to the appropriation and implementation process including Congress’ role and the Executive’s role as defined in the Udot­ case. (Note: a copy of the Udot case was provided to Congress during the first [closed door] meeting with them on January 21st). President Mori asked for an agreement to be reached between Congress and the Executive on improving the appropriation and implementation process. President Mori responded, “No,” further stating that the Executive could not “force” anything on Congress. There should be a voluntary agreement between us to do the right thing. Congress should have meetings with constituents, hold public hearings, and produce Committee Reports” that would assist the Executive in the implementation process through the PCD with attachments. And, it would provide equal treatment whether it was for the Executive’s operational budget or Congress’ public projects (all involving public funds). Chairman Simina stated that public hearings are not always necessary because they do speak to constituents, but admitted that guidelines would go a long way. Chairman George stated that from this point forward, he would hold public hearings but wasn’t sure if they would translate into Committee Reports. Chairman George also stated that the location of the public hearings might be Kosrae as opposed to Pohnpei. President Mori acknowledged Chairman George’s willingness to hold public hearings. When asked again about the implementation of the $4.9 million, President Mori said to be fair, he would move forward with implementation this time, but would hold on implementation of subsequent public projects in the future if they failed to have enough specificity, failed to state the purpose, etc., in order for the public projects to be implemented correctly by the Executive, or if the Udot case was violated. President Mori also stated that the violations of the Udot case where Congress is hiring personnel out of its budget, but placing them under a contract signed by TC&I to implement projects, must immediately stop. FSMIS (January 30, 2014): Federated States of Micronesia President Manny Mori transmitted to Congress a supplemental budget request totaling $12,430,305.00 on January 20. An Amount of $49,712,485.00 was projected to be available from domestic revenue for the National Government in fiscal year 2014. In addition, the was a carry-over from FY 2013 revenue in the amount of $11,385,736.00. This meant that a total amount of $61,098,221.00 was available for budgeting at the start of the fiscal year 2014. During the September session, Congress appropriated $41,653,844.00 for all operations of the National Government out of the $61 million in Public Law 18-15. A Typhoon Relief appropriation of $225,000 was made followed by the first supplemental budget appropriation of $1.8 million. These were followed by the latest Public Project appropriation of $4.9 million, leaving an unappropriated mount of $12,430,305 in revenue. Given the situation, President Mori provided to Congress his latest proposed fund allocation against the available amount as detail in the table below. Dept. of Education – Operation Budget 3rd & 4th Qtr. Dept. of Finance & Admin. Custom & Tax Admin. Office of the President – Presidential Visits – Outer Is. The above supplemental budget request is one of the last items being considered by Congress as it is ready to adjourn its third regular session this Saturday, February 1st. FSMIS (January 30, 2014): The 18th FSM Congress has extended its Third Regular Session through the adoption of Congressional Resolution No. 18-126 on January 29. The session was scheduled to adjourn on January 29, but Congress felt it needed additional time "to consider a number of important issues that remain pending before it", as the resolution states. One of the items in front of Congress is the supplemental budget request of $12,430,305 requested by President Manny Mori on January 20. Some of these request were submitted to Congress during the November 2013 session but were not approved, now resubmitted for reconsideration. Some of these budget item requests include the $5million Set Aside Fund; $3.2 million for FSM Telecom project; operation funding for the Project Management Unit (PMU); About $71 thousand for the implementation of the recently adopted Overseas Development Assistance Policy (ODA); and the 3rd and 4th Quarter operation budget for the Department of Education, among others. A more detail breakdown on the items requested under "supplemental budget request" will be available soon. FSMIS (January 24, 2014): Federated States of Micronesia President Manny Mori expresses "warmest congratulations" to Australia Prime Minister Tony Abbott and the people of Australia on the occasion of their celebration of Australia Day. "While Australians celebrate this day and reflect on the country's great achievements, we share in your festive spirit and ponder on the privileges and benefits we have enjoyed sine the establishment of our diplomatic relations. My country attaches great importance to its bilateral relations with Australia and take much pride in it. With your great leadership, Australia will continue to make significant progress for the betterment of its people and carry on the universal recognition of being a "global citizen". Given our shared perspectives on many regional and international issues, I am confident that our strong bilateral relationship will continue to flourish." The President further expresses that FSM stands with Australia as a Pacific partner "joined by common bond of friendship and family". President Mori sends his congratulatory message today, January 24. 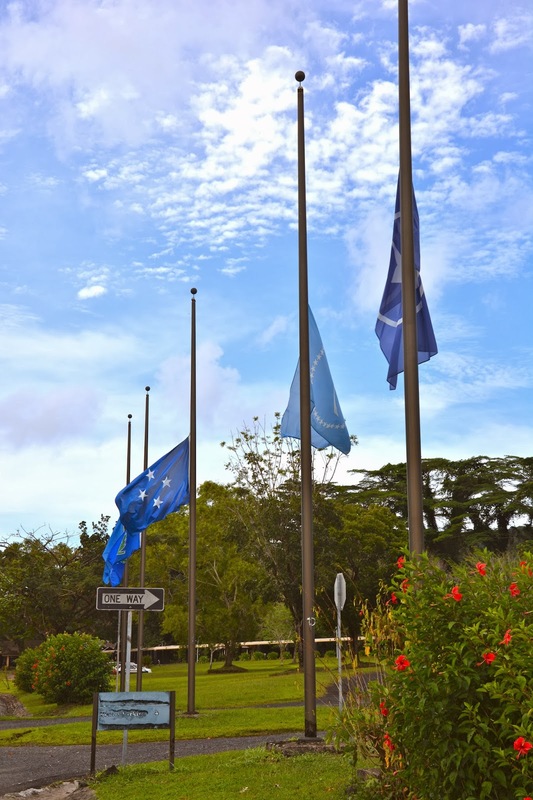 FSMIS (January 24, 2014): Federated State of Micronesia President Manny Mori proclaimed on January 22 that a three consecutive days mourning period from January 24 to January 26 will be observed in honor of the late Ritis K. Heldart, Lieutenant Governor of the State of Chuuk. The late Honorable Ritis K. Heldart was called to his eternal rest on January 4, 2014, in the United States where he was on medical referral. Among a number of civil duties, the late Honorable Heldart was elected a delegate to the FSM Constitutional Convention in 1990 representing Chuuk State. He later became the Vice Consul General at the FSM Consulate Office in the Territory of Guam. He recently became the Lieutenant Governor of Chuuk State in 2011. "...the late Honorable Ritis Ko Heldart had over thirty years of dedicated public service and has earned the respect of the leaders and people of Chuuk. He is affectionately remembered as a notable leader and public official." "...this Proclamation carries the heartfelt condolences of the people of the entire Nation to the family, relatives and friends of the late Honorable Ritis K. Heldart, as we all join them in bereaving the loss of our countryman." The FSM Congress adopted Resolution No. 18-109 on January 22, "expressing the sadness and condolences of the Eighteenth Congress of the Federated States of Micronesia", introduced by the Chuuk Delegation. A state of mourning in Chuuk, declared by Governor Johnson Elimo, has been in effect since January 4. The remain of the departed Honorable is expected to be received in Chuuk on January 24. FSMIS (January 23, 2014): The Federated States of Micronesia President Manny Mori has declared a "State of Emergency" for a period starting on January 22, 2014, to February 22, 2014 to kick-start a chain of actions after a declaration from Pohnpei State Governor John Ehsa was made on January 21 based on environmental threats from the grounded fishing-related vessel, Ping Da 7. The President made the declaration on January 22. The Ping Da 7 ran aground on the Pohnpei reef 44 days ago, early morning of December 11. "The M/V Ping Da 7 remains aground with a substantial amount of dangerous fuels, gas, chemicals remaining on board, posing a substantial environmental threat to the people of Pohnpei State and the Federated States of Micronesia", the Presidential Declaration states. Reports of oil leak from the vessel have been made a confirmed. The Declaration specifies that during the period of the State of Emergency, "all immigration, customs, and quarantine processing and clearance may be temporarily relaxed to facilitate and expedite the dispatch of experienced personnel, specialized vessels and equipment to deal with the matter at hand in order to save life or minimize damage to property, the environment, livelihood and quality of life of all the people of the Federated States of Micronesia". The chairman of the Joint Taskforce on the Ping Da 7 situation and the FSM Office of Environment and Emergency Management have been instructed to look into specific actions that must be undertaken following the issuance of the State of Emergency declaration. FSMIS (January 23, 2014): Resulting from recent consultations between the President and the Congress of the Federated States of Micronesia, a decision has been made to create a Joint Working Group to explore remedies to issues relating to the Project Control Document (PCD). In his January 21 letter to President Manny Mori, Speaker Dohsis Halbert stated, "Thank you for the meeting that we had this morning. All members present appreciated the candid and constructive discussion. We agreed to have a joint working group of Congress and the Executive to explore some of these issues relating to PCDs". The Speaker suggested that the working group hold its initial meeting on Monday, January 27. President Mori responded to Speaker Halbert on January 23 by saying, "Thank you for your letter of January 21, in which you nominated members of Congress for the Joint Working Group to meet with the Executive regarding Public Projects and the PCD process". "I appreciated the opportunity to meet with you and the members of Congress on January 21, and look forward to a mutually acceptable outcome of the Working Group's efforts". The President offered that the initial meeting take place at the President's Conference Room at 1:30pm, keeping the meeting date as suggested by the Speaker. The Working Group members from Congress as indicated by the Speaker includes: Senator Peter Christian, Senator Wesley Simina, Senator Yosiwo George and Senator Joseph Urusemal. From the Executive side, the President designated The Vice President, the Secretary of Finance and Administration, the Secretary of Justice, the Secretary of Transportation, Communication and Infrastructure, and the Director of SBOC. For inquiry, email fsmpio@mail.fm or call 320-2548. FSMIS (January 23, 2014): Since January 17, communications on 2023 public awareness meetings with have been sent to respective Governors, Presiding Officers of the Legislatures as well as the Chief Justices in all the four State Governments in the Federated States of Micronesia. In his letters, FSM President Manny Mori wrote, "In the last 2023 Planning Committee meeting in Saipan, it was agreed that there is a critical need for raising awareness about the challenges facing our nation in 2023 and beyond". The 2023 Planning Committee was created through Executive Order No. 40 on March 6, 2012 primarily to "undertake assessment of the nature and magnitude of the financial situation of the FSM Governments in 2024 onward and identify the expected budgetary shortfalls; explore different alternative and funding scenarios for addressing the projected budgetary shortfall" and make recommendations to the Leaderships on action plans to be undertaken. 2023 marks the termination of financial assistance to the FSM from the United States under the Compact of Free Association between the two Nations as amended and became effective since 2003. The awareness meetings have been scheduled to be held on January 23 in Pohnpei State for officials from Pohnpei and Kosrae; January 28 in Yap State; and January 30 in Chuuk State, with specific meeting details being subject to coordination between State Officials and the 2023 Planning Committee Secretariat. The FSM Office of SBOC and the FSM Department of Resources and Development share managerial roles for the Secretariat with technical assistance from the Asian Development Bank and the Pacific Islands Forum Secretariat who also provide advice to the Committee. For queries, please contact the Office of SBOC at (691)320-6260 or email fsmpio@mail.fm.